The United States has called for Syria's "full co-operation" in trying to achieve a comprehensive Middle East peace settlement. 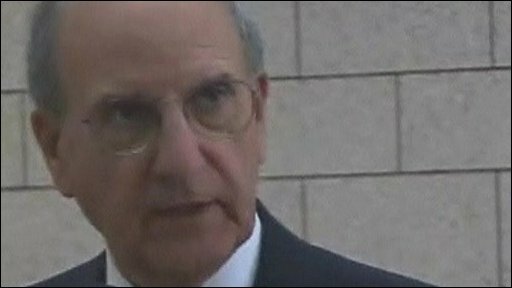 Speaking after talks in Damascus, Barack Obama's envoy George Mitchell said discussions with Syria's president had been "candid and positive". Mr Mitchell said restarting peace talks between Syria and Israel was a "near-term goal". He later arrived in Israel, to try to revive Israeli-Palestinian talks. Mr Mitchell's visit to Damascus was his second since June, amid a renewed US push for peace since President Obama took office earlier this year. The envoy's trip comes ahead of a string of visits to Israel this week by leading Obama administration officials, at a time when US-Israel relations are unusually strained. Mr Mitchell said he had told Syrian President Bashar Assad that Barack Obama was "determined to facilitate a truly comprehensive Arab-Israeli peace". "If we are to succeed, we will need Arabs and Israelis alike to work with us to bring about comprehensive peace. We will welcome the full co-operation of the government of the Syrian Arab Republic in this historic endeavour," he said. Correspondents say the visit was not expected to bring a breakthrough, but Syrian officials have been encouraged by Washington's new willingness to listen. Damascus is a major player in the region, because of its support for the Palestinian militant group Hamas, its backing for Hezbollah in Lebanon, and its close links with Iran. This made Syria a pariah in the eyes of the Bush administration, which cut virtually all ties with Syria. The BBC's Lina Sinjab, in Damascus, says President Obama's commitment to talks with all parties is welcomed in Syria but not with much enthusiasm. Getting back the Israeli-occupied Golan Heights is a priority in Damascus, our correspondent says. Syria was expected to lobby Mr Mitchell on the issue of the Heights, a strategic mountainous area seized by Israel in 1967. Syria's official news agency quoted President Assad as stressing to Mr Mitchell "the Arab right to recover occupied lands through achieving a just and comprehensive peace." Direct talks between Israel and Syria broke down in 2000 over the scale of a potential Israeli pull-back on the Golan Heights. The diplomatic flurry comes at a time of strained relations between the US and Israel. The BBC's Middle East correspondent Katya Adler says Mr Obama has been leaning on Israel's government unusually hard for an American president. Washington has called on Israel to stop all Jewish settlement building in the occupied West Bank, but Israel says it will not curb what it calls "natural growth" there. Mr Mitchell arrived in Israel later on Sunday and met defence minister Ehud Barak in Tel Aviv. In an effort to kick-start stalled Israeli-Palestinian talks, the envoy is due to meet Palestinian leader Mahmoud Abbas on Monday and Israeli Prime Minister Benjamin Netanyahu on Tuesday. Shortly before Mr Mitchell's arrival in Israel, Mr Netanyahu said he hoped to reach an agreement with the US. "This relationship is important and strong. Naturally, in the context of friendly relations between allies, there isn't agreement on all points, and on several issues we are trying to reach understanding," he said. As well as Mr Mitchell, US defence secretary Robert Gates and National Security Advisor James Jones are also due to hold talks in Israel. Our correspondent says Iran and its nuclear programme will certainly be discussed. Israelis say that is their top priority but arguably the focus of the visits will be the possibilities for peace between Israel and the Palestinians and also the wider Arab world, she notes.